I found this poem on the On Being site: https://onbeing.org/blog/inheritance-a-poem/. I love it. I will paste it below, then tell you why I love it. Oh, honey. Life is hard. Oh, honey. bad colds and depressive breakdowns. by holding on to the bed mattress or her mother’s coaxing hands. circling, spinning, heart-pounding joy in that open icy wind. Could I have been good? Or strong? Or athletic? what it felt like to occupy something unbroken. hard like January ground that the dark wind pounds down. but that will take the flesh right off you if you hold it. and marked me for a kind of weary defeat. if I was seeking something whole from my days. for her sake I told myself, but really for mine. that what belonged to her was not mine to rewrite. take up a blank page and create new. can be a still, quiet kind of love. in this hard, beautiful world. I know. It's long. It's "dark." Those are things I've heard when I've proposed reading it in a worship service. Not easy to explain or share in a worship service setting. OK. I can accept that. But here's why I love it. It reminds me of my mom, and also of myself, when growing up and dealing with me and my kids growing up. My mom said often, and so did I, that life is difficult, life is hard. I am grateful still that I approach life knowing it is difficult, and when it's not, that's a bonus. something to notice and be grateful to God about. I'm not talking about pessimism, and of course I always know that life is in God's hands, but I also know that life is hard, bad things happen, there's evil in the world. We have a family joke. One time a family friend said, "All I want is a life with no hassles. Is that too much to ask?" It made us all laugh when we heard it. Yes, that IS too much to ask. Life is full of hassles. A book I really appreciate is The Road Less Traveled by M. Scott Peck. It begins: "Life is difficult. This is a great truth, one of the greatest truths. It is a great truth because once we truly see this truth, we transcend it. Once we truly know that life is difficult-once we truly understand and accept it-then life is no longer difficult. Because once it is accepted, the fact that life is difficult no longer matters." That's what I mean -- if you know life is difficult, then when it's not, bonus. And when it is, well, that's life. 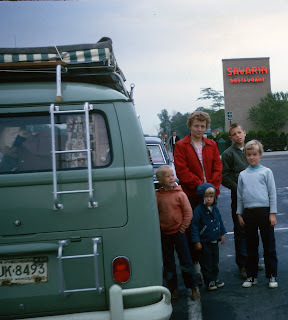 Volkswagen camper criss-crossing the USA. Besides that, don't you love this line: "Oh, honey. Life is hard. Oh, honey." And this one: "It was always said gently and meant tenderly, often preceded by Uff-da." My mom never said "Uff-da," but I love it. Uff-da.